Our books are available to order – simply please contact us for more information. This first book, in the Tales from Tuggyland series, introduces the main characters. 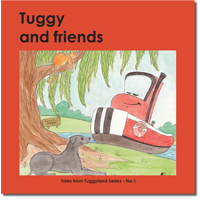 Of course there's Tuggy, a bright red, little tug boat and his friends Barka and Cat. Tuggy's smaller brother and sister, TuggyBen and TuggyBelle are always dropping by to say hello and Trixie the trip boat is never far away. With blue summer skies and the joys of messing about with boats. Tuggy and friends welcome you to Tuggyland. Book 2 in the Tales from Tuggyland series. A tale of caution to be careful near rivers, even in your sleep! 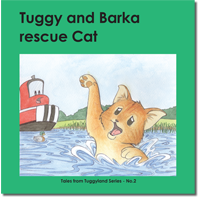 Cat is lucky to have two good friends in Tuggy and Barka who come to the rescue. Book 3 in the Tales from Tuggyland series. 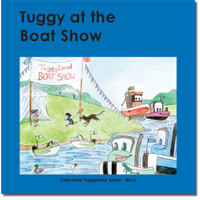 The annual Tuggyland Boat Show is here. Everyone is looking forward to the show and dressed up to impress the judges. Barka is more interested in his favourite food than looking smart, which is just as well. Black dogs and ice cream can be very messy for everyone. Book 4 in the Tales from Tuggyland series. Tuggy is snoozing under the willow tree when Thumpa & Dumpa come along & spray him with smelly mud. 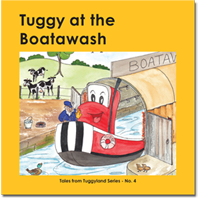 Tuggy takes a trip to the Tuggyland Boatawash where Mr Boata gives him a wash & polish. All his friends are pleased to see Tuggy bright & shiny again. 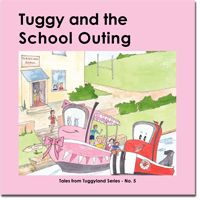 This is the 5th book in the Tuggyland series and Tuggy & Trixie are getting more adventurous - they take the boys & girls from Tuggyland School on a trip out through the gates of Tuggyland and onto the big wide river. They see a railway bridge across the river and a green train comes along. The Tuggyland Colouring Book is full of favourite pictures from the Tuggyland series. Suitable for children 3/7 years, it can be personalised with owner's name & age.